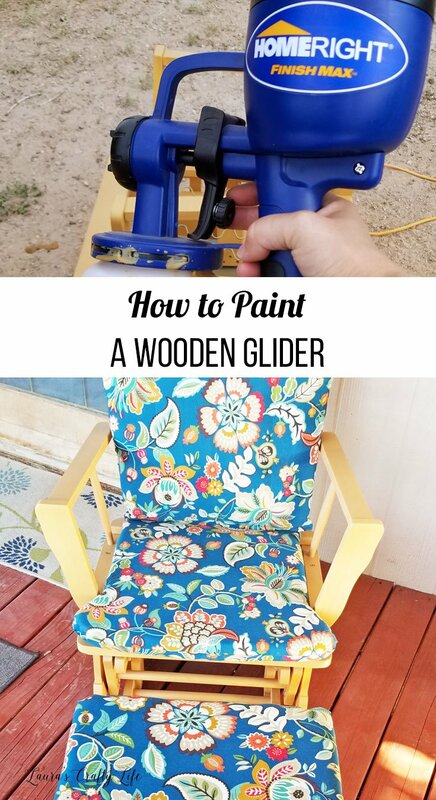 How to Paint a Wooden Glider. 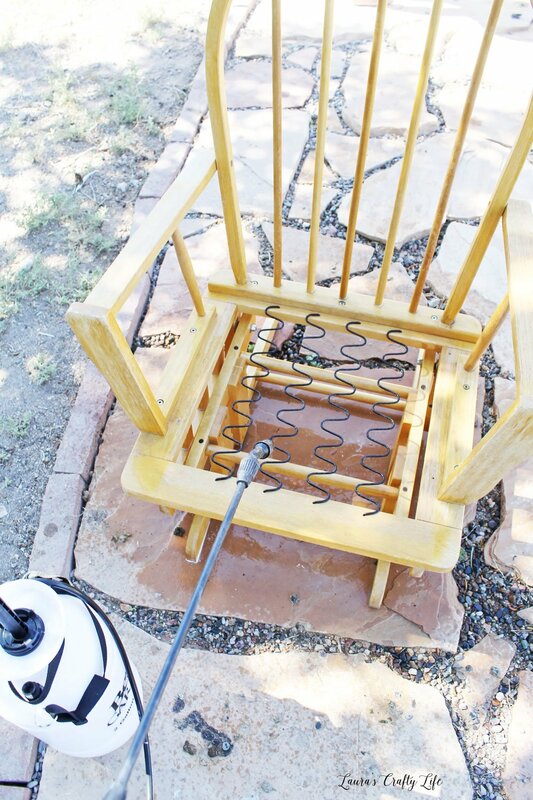 Use the HomeRight Finish Max Sprayer to easily paint your wooden glider to make it look like new again! When my kids were babies we had a wooden glider rocking chair and ottoman in their rooms so I could rock them and nurse. It was one of my favorite places to sit with them with they were tiny. This post contains affiliate links. If you purchase something through the link, I may receive a small commission at no extra charge to you. Please read my full disclosure policy here. 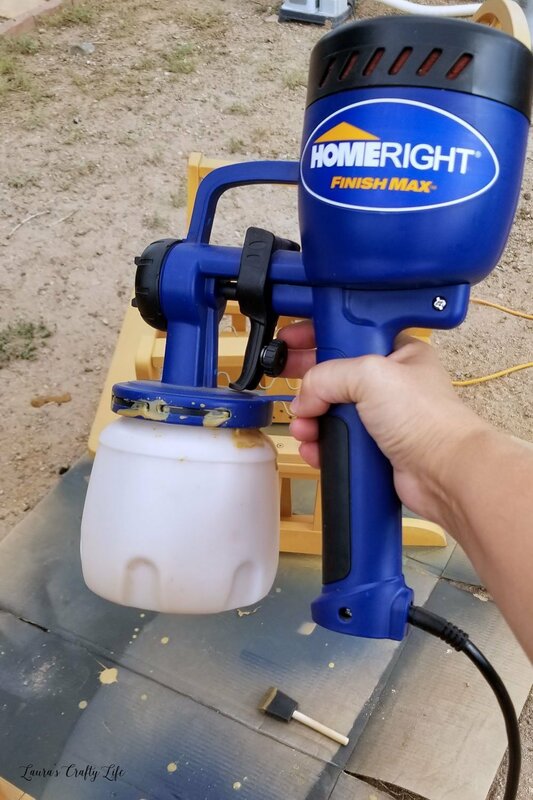 Thank you to HomeRight for providing me with a sprayer. The glider moved around the house until we finally didn’t have space to keep it in the house. 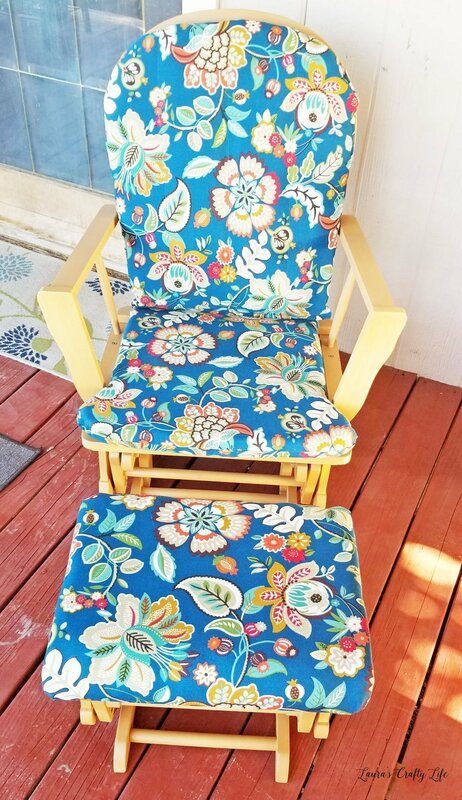 I set it out on our porch knowing I would use it out there for reading and enjoying the backyard. Unfortunately, since it was kept outside it wasn’t holding up very well and it needed to be refinished. Rather than simply throwing it out, I decided to give it a makeover. I started by taking all the cushions off the chair. 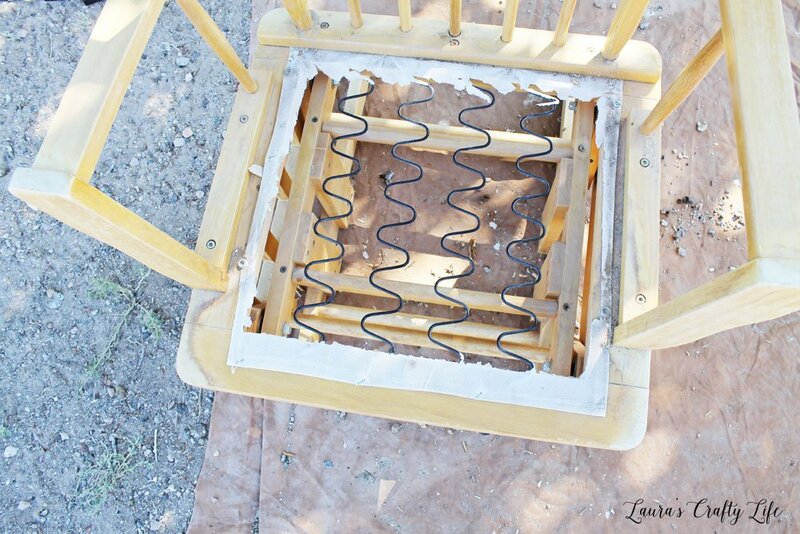 I removed the upholstery underlining – the thin fabric that is used under the chair cushion but over the springs. 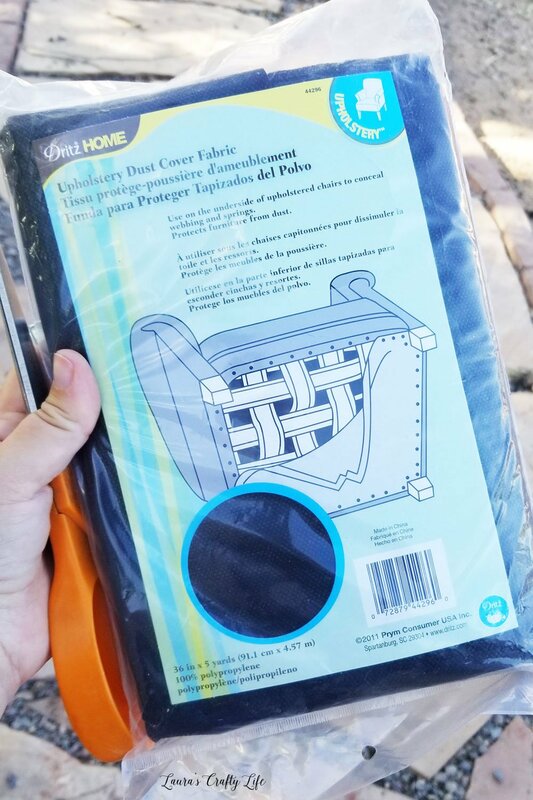 It helps to keep the fabric on the chair cushions from getting snagged on the springs. You want to be sure you remove all the staples, as well. Prying them off with a flat head screwdriver works well for this step. I also unscrewed the top cushion from the ottoman. When I was finished I was left with only the chair frame and ottoman frame. I didn’t have to do much sanding to my glider since it had been sitting outside for about two years before I tackled this process. I did smooth out any rough edges using a sanding block and to rough up the surface a little to allow for the new stain to adhere. 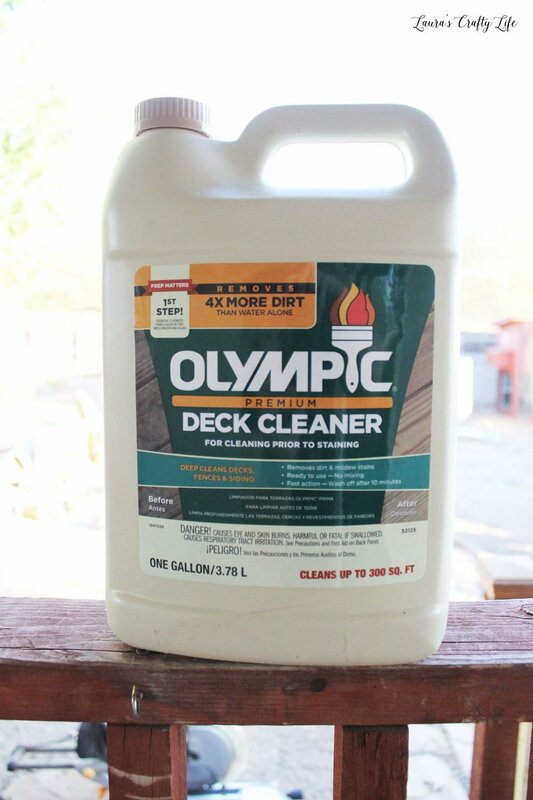 Once I had it stained, I cleaned the entire glider with deck cleaner. 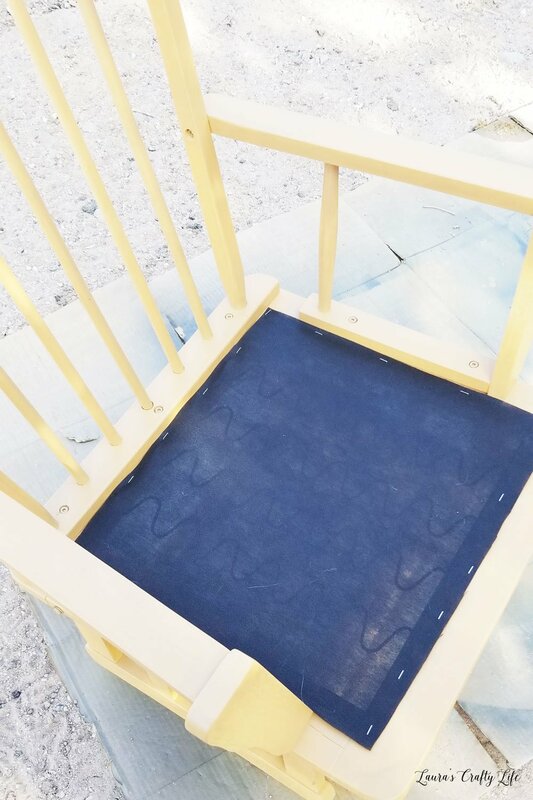 This step may not be necessary for your glider, but since mine had been sitting outside, I wanted to be sure the wood was very clean and free of any dirt. 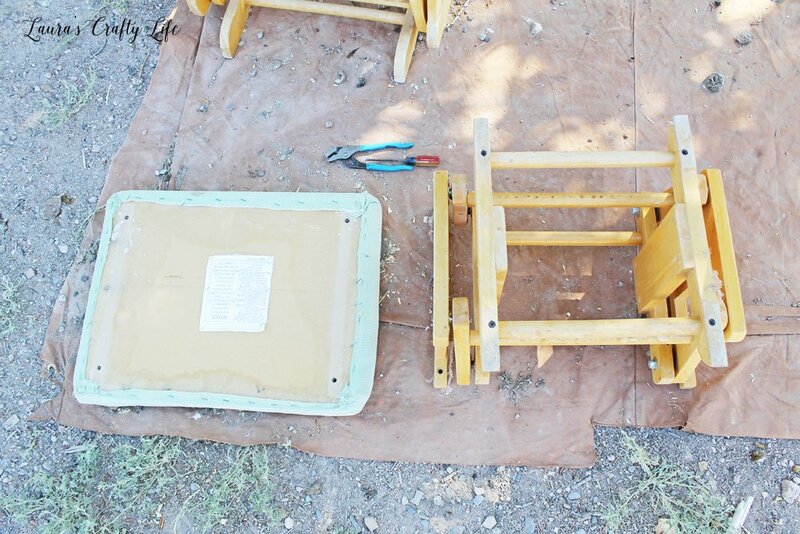 Since I knew that I wanted to have this furniture outside, I opted for stain rather than paint. We live in northern Arizona where the weather is pretty harsh. We get a lot of sun and wind, but also rain and snow. I know stain holds up better than paint outside. Note: The process is the same whether you choose to paint or stain. 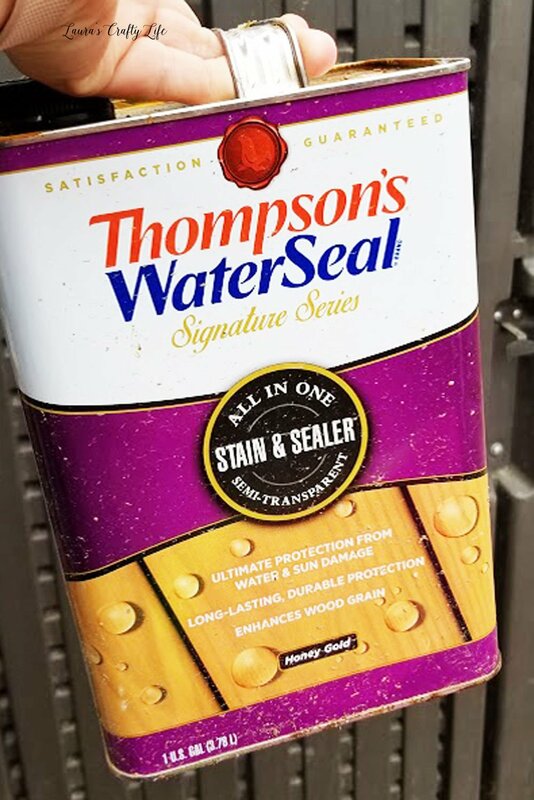 I chose Semi-Transparent Thompson’s WaterSeal in Honey Gold. I chose a color that best matched the original wood color. The HomeRight Finish Max Sprayer is ready to go right out of the box. Simply add your stain to the container, screw it onto the handle, and start spraying. It helps to practice on a piece of cardboard before you spray your project to be sure that you have the sprayer set to the correct pattern first. I ended up doing two light coats of stain, following the instructions on my particular stain for dry time between coats. 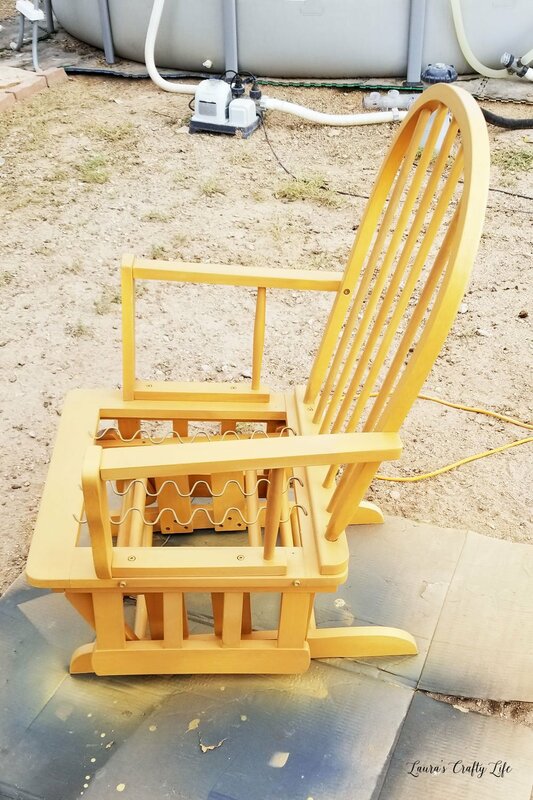 I allowed the chair to dry for 24 hours before the next step. As I stated earlier, my chair was pretty banged up. 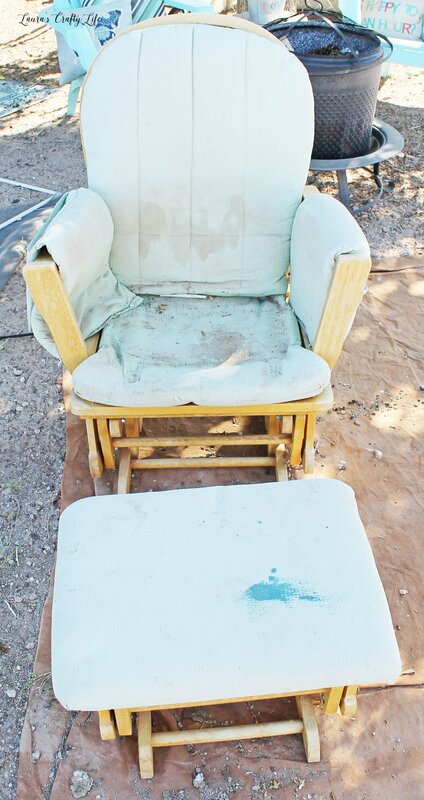 I opted to replace and not re-use the upholstery underlining the chair had previously as it was in pretty bad shape. You can purchase the underlining from your local craft store. 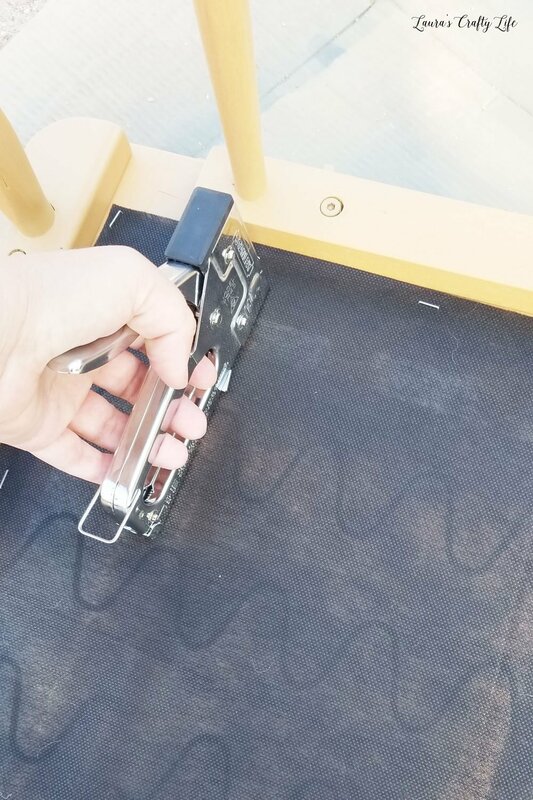 I cut a piece to fit and stapled it in place on the chair seat area using my staple gun. Then, I was able to add the new cushions I sewed. I will be sharing a tutorial on how to make your own cushions without a pattern soon! I love having the glider looking so good again. It is one of my favorite spots to sit outside to read a book or watch my kids play. So glad this was helpful! 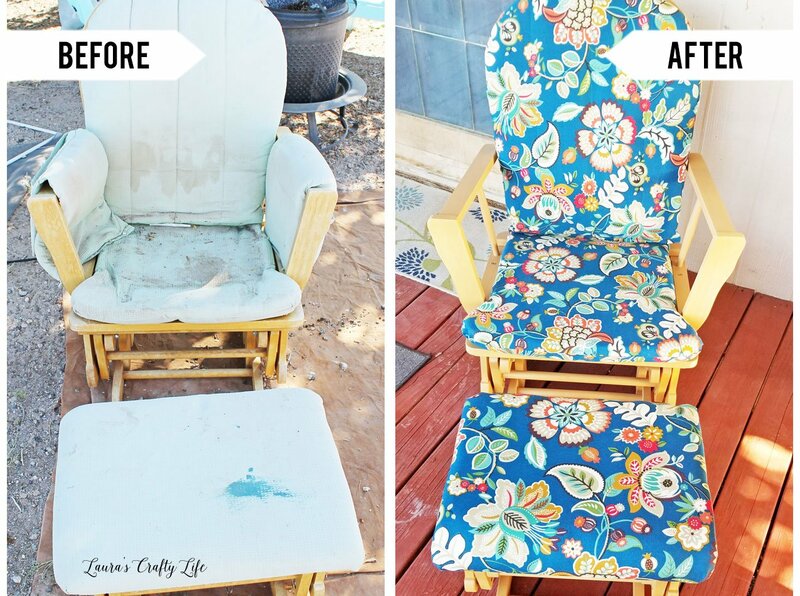 I would love for you to share your finished chair project in our Facebook community!